It’s a well known fact that men often have problems expressing how they feel to someone, even someone they truly love and this is frustrating for ladies who are not sure of their stand in their relationship. They often find themselves wondering if their significant other loves them at all. It doesn’t have to be so because it's really not that complicated. Guys will always tell you all you need to know without ever saying a word, if you just pay attention, straight up. Hence, if your man is expressing any of the signs below, chances are you have nothing to be anxious about. 1. He isn’t avoiding you. One of the first and surest ways to know that he loves you is one that is often overlooked by most ladies, maybe it seems so obvious though. It doesn’t mean it isn’t a giveaway. However, if he is with you, it’s most likely he loves you. Guys don’t make a habit of staying with ladies they careless for, and they certainly don’t make time for them either. It’s a waste of a guys precious time to stick around a lady he has no intentions for. In fact, it could be disgusting to some guys if the lady they careless for want to be around them. So, if your significant other isn’t avoiding you every chance he gets but instead does whatever he can to be around you, sure, he isn’t doing it because he hates you. He’s trying to be around you because he desires to, and he does so because he loves you. 2. He wants to know all about you. If he truly loves you, or he is close to falling for you, he wants to know all there is to know about you/family. He will certainly ask questions about your family, your desires, you dreams, your wishes and your general well-being. His desire will be to know you on a deeper level. He wants to know your make up. You may ask why? Simple- because he cares about you and knowing the answers to his numerous questions will help him understand what it takes to make you happy and that is true love with great responsibility. Read Annoying 10 Big Habits That Guys Hate-Ladies Watch Out! This is a serious deal breaker for intending couples. There is a more feeling of security and assurance when this pops up. Have you met his parents? If yes, or if he has made plans to formally introduce you to them it’s almost guaranteed that he is deeply in love with you. Meeting parents of our significant other is really a big deal for both male and female in this part of the world. And this isn’t what you do with someone you don’t care about. 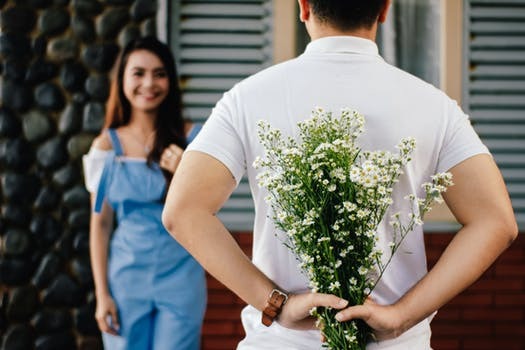 If a meeting with his parents is on the horizon, you can breathe a sigh of relief because it most likely means he loves you and will soon walk the aisle with you. Wink!! If you are wondering if the guy in your life has these feelings for you that you desire, keep an eye for the signs listed above. He’ll soon tell you all you need to know without saying it. You got him right?